Could there be plate tectonics on other worlds? One former Idaho scientist thinks it’s possible. Until now, the movement of pieces of a planet’s crust was found nowhere else in the universe except Earth. 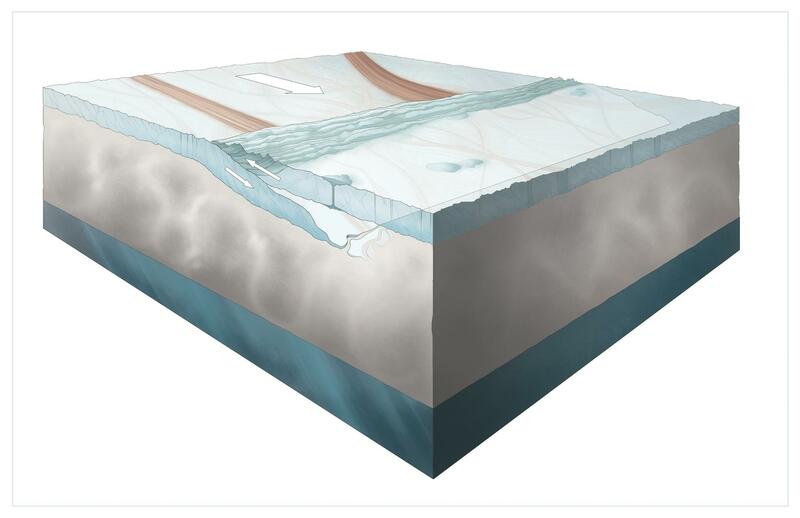 Artist's concept of one ice plate on Europa sliding beneath another plate. It was the late 1990s and University of Idaho planetary geologist Simon Kattenhorn was looking at one of Jupiter's moons named Europa. NASA’s Galileo orbiter took the pictures of it. Using those images, Kattenhorn discovered something remarkable. “The surface of Europa is actually made up of broken fragments that are moving relative to each other, very similar to how the tectonic plates move on Earth,” says Kattenhorn. In order to have plate tectonics, Kattenhorn says, plates must do three things. They must pull apart from each other, they must move laterally against each other and they must dive down below one other. On Earth, the "plates" in plate tectonics are rock which move around on another layer of warmer rock. But Europa is covered in ice that’s about 18 miles thick above an ocean of water. Kattenhorn says those ice plates may be shifting about on a layer of warmer ice below. If his theory is correct, it would mean there could be materials on the surface of Europa that were brought up from below and then hit by radiation. “These chemical compounds on the surface are altered by that radiation and they actually get converted into what we call oxidants that could be very important for a habitable environment,” Kattenhorn explains. If those oxidants are being recycled back under the ice and into the ocean through plate tectonics, Kattenhorn says that gives Europa a better chance of having the components for life to develop and survive. Kattenhorn is now working in the private sector but he’s still studying Jupiter’s moon. He says more work is needed to test his theory. He’d love to see NASA launch a mission to Europa. Kattenhorn’s research was published online this month in the journal Nature Geoscience.